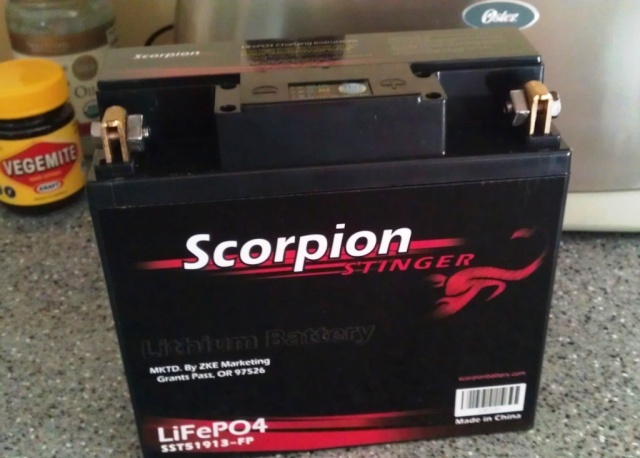 A battery company in the state of Oregon (Or-a-gun) I deal with sent me this battery to try. It's the correct size to replace the BMW/Exide GEL, OEM part number 61 21 2 346 800, which fits the majority of K bikes, Oilheads, the Hexhead R1200RT and the K1600GT/GTL. It's made in China of a four cell design and it's a lithium iron variety (not ion) and I'm gunna give it a thorough work out. Their part number is the universal part number 51913. I don't know how much they'll cost just yet. 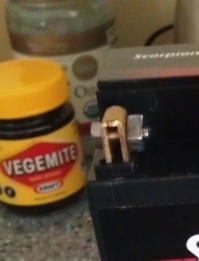 Let's hope it has as much juice as my morning slather of Vegemite on toast! I have already got the Genius-brand charger they happen to recommend. When I arrived home from work and toil I plugged it in and it went from red to green (full charge) in about five minutes' time. It's got a static voltage reading of 13.35V and is supposed to be used only with controlled voltage chargers of a 15V limit. At full charge my Genius is putting out 14.2V, which is acceptable. I'm replacing the BMW/Exide tonight and have access to a charger at work and at home. I've not had good experience with the Shorai LFX lithium battery so while I remain open minded I am a bit sceptical as well. We returned over 60% of the new Shorai batteries we bought and sold when they released them. That's a dismal track record. I understand that they've improved their ratings per the bike intended. However, it's still once bitten, twice shy. Let's see how this one goes. By the way, I whacked it onto our postal scale and it came up at 1.6 kilos (3.6 Lbs) as compared to the factory battery at 6.2 kilos (13.6 Lbs), a ten Lb saving! That is a huge weight saving. Nuh, bought it here. 200 grams, US$8.99.... 'Merican prices. What is the physical size and capacity of it in Amp Hours. At standing voltage of 13.3 it will stop the under voltage problems with ABS 1. @RicK G wrote: What is the physical size and capacity of it in Amp Hours. 180mm wide x 170mm tall x 76mm deep, same as the PC680 Odyssey (and anything other than the "brick" battery of some K and Airheads) that's waiting to go into either the GT or the RT when something karks it. By Mac on Oct 24, 2013, Ownership: Just Bought, Knowledge Level: "AC/DC is more than a band." Note that they're mail ordering it in the US (with free priority mail) for US$169, with a $218 retail price. The Factory BMW/Exide is retailing for $195 and we sell it for $179 plus 9.5% tax. So not too bad a deal. Prolly add a bit to OZ, South Amrica, or Europe. Lemme check what my cost is tamoree back at work. All that tells me is that they wont tell because its less than 1/2 of the same physical size lead acid. If I am going to run my CPAP machine of it then I need to know. Great for starting lousy for capacity at slower discharge rates. All waffle and no ice cream all they do is tell how much better their battery is compared to all the other brands who tell you how their batteries are better than all the other brands who tell you how their batteries are better than all the other brands who tell you how their batteries are better than all the other brands. Skeptical yes but one thing I have learned in my life time is that I have not been anywhere skeptical enough. i see a problem for many of us though ....almost all the regulators fitted as standard are going to limit to 13.8 volts ....and as specified by the manufacturer they require 14-15 volts to charge properly (different cell voltages and charge requirements ). a couple of the friends (geeks ) here at work run li ion batteries in their scate boards (electric ones ) and get far more go and running times than the equivalent gell cells ...as they put it by heaps ...anothher runs li ion on his motorised push bike ...he also recons they they are great ...been doing it for over 8 months now ...(reclaimed battery packs from electric drills actually ) repacked into 42 volt battery packs ...along with his 900 watt electric motor gets him over 15 ks one direction to work each day and back home (the motor is the size a little larger than our starter motor ....but more like a stepper motor with about 3 degrees per pole as you try and turn the thing by hand at rest ) the scate boards rip past the workshop at well over 25 mph , they carry a small remote control in one hand for speed control ...bit like the old radio control battery cars ...with single hand controller . A lithium-ion battery (a.k.a Li-ion) is rechargeable type of battery with lithium cobalt dioxide (LiCoO2) or lithium manganese oxide (LiMn2O4) as a cathode. A lithium-iron battery is also a rechargeable type of battery but made with lithium iron phosphate (LiFePO4) as the cathode material. Generally, anodes are made up of carbon in both batteries. Actually, lithium-iron is a newer version in the lithium battery family type. We know that we aren't s'posed to charge them for extended periods nor charge them at rates over 15V. There are red flags all over the packaging and on the battery warning of this. The first thing you notice with a Li-iron battery is that it spins the starter quite a bit faster. 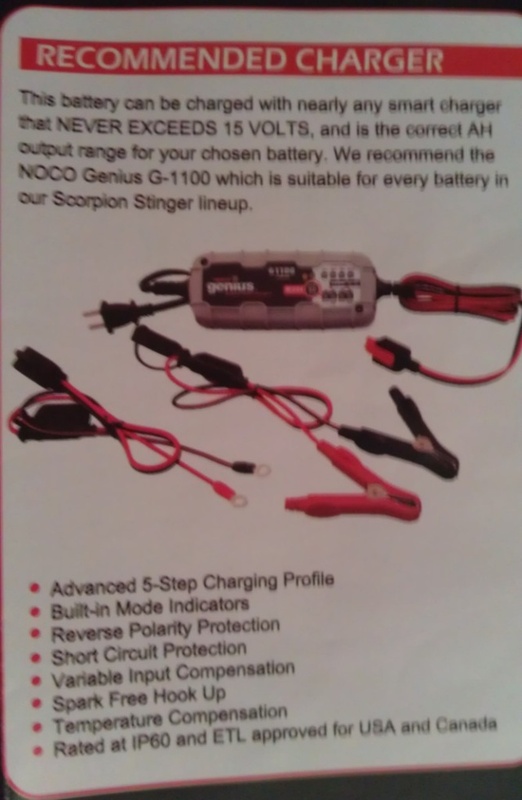 Using a voltmetre on the connections also shows that the voltage level doesn't drop nearly as far as an AGM, GEL or flooded lead-acid battery would. 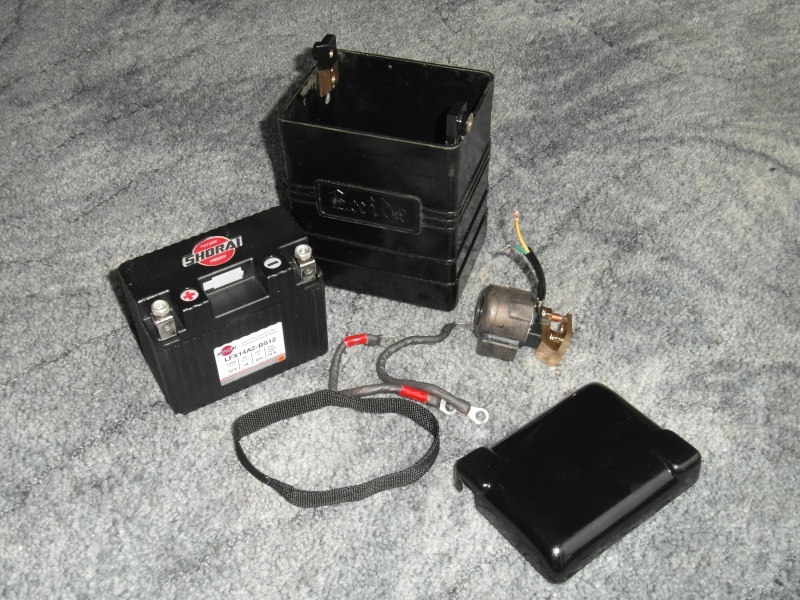 Often a lead-acid battery will drop to under eleven volts. This one barely drops below 12.5V. So Rick's idea that you might avoid ABS low voltage warnings is prolly correct - but let us see how long the battery stays at full voltage with repeated use. My K-GT has the higher output 60A alternator because it has heated seat, heated grips, etc., so its ability to keep the Li-iron battery at full charge is pretty good, since it has the reserve to do so. I have procured and am fitting a digital, backlit, mini-voltmetre on the dash to monitor the proceedings as I ride. Two of the main reasons for such a high failure rate of the Shorai Li-iron batteries initially was because, a) they were let go flat for too long and were catalogued/underrated for the application, then would not accept a charge when flat. It seems they were trying to show how good they were (by making them physically too small/not enough cranking amps) they just didn't have enough capacity. Also, b) they need to be charged with a certain type of charger which plugs into a port on the top of the battery, not at the pos/neg connections, and most users didn't spring for this charger. 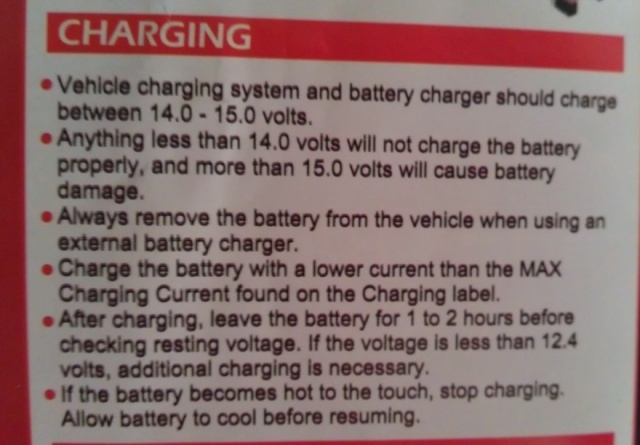 Warnings abound about not using a traditional 'Battery Tender' type charger due to too high a charge rate and the pulse/anti-sulfation feature of most of them. This destroys these batteries. They are significantly upgraded/rated/sized in the newest catalogues now with a far less failure rate. I still don't stock or sell 'em. Let's see how we go. Waffles 'n' ice cream. Yummo. I've recently fitted a Shorai lithium iron (14AH equivalent) on my Vincent to drive an electric starter. It's the smallest battery case available and I've fitted it into an Exide battery case along with the starter solenoid. It's charged from an ultra powerful Lucas 60W dynamo, controlled by a DVR regulator and, so far, it's been working well; even though it's turning over a 998 v-twin through the gearbox and primary drive before reaching the crankshaft! I'll keep my fingers crossed that I've got a good Shorai. But I've still got a kickstarter and magneto. 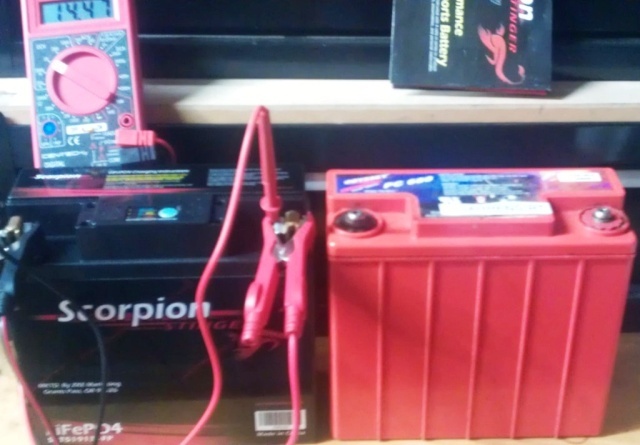 The other day it dawned on me that in combination with the recently fitted Two Bros exhaust system which weighs under 9 lbs (4 kilos) in total, and this Scorpion battery, which weighs 3.6 lbs (1.63 kilos), I've saved 30 lbs (13.6 kilos) from stock. The factory exhaust and battery were 28.6 lbs and 13.6 lbs, respectively. I've personally lost five lbs this week due to a heavy chest cold, so there's another few kilos off the top. It's a pity I haven't been able to ride more, other than back and forth to work, since the weather has changed for the better round these here parts. It's all bright green and loverly again, windows thrown open, birds galore, tall grass, trees full of leaves, and flowers bursting out everywhere. I've been able to spot snow-covered Mt Rainier looming large each morning from my front steps. It was 25 yesterday and today it'll be 28 or 29, warmer than Brissy for a change! Expect some rain and mid-teens for the weekend, once again. This place isn't quite heaven. The new L-I battery is acting just as a battery should. I monitor the voltage as I ride and again once the bike is shut down and put in the garage at day's end. Nothing to report but those facts. Let's see how she goes as time passes. I love that it's ten pounds lighter than the original GEL battery, too! » Any ideas on small DIY 7.4v lithium battery? » Minelab Lithium ion Battery for GPX4500 - Life Length?